The late, rainy spring could produce favorable conditions for a bumber crop of mosquitoes, just in time for the return of the West Nile virus season. But droughts are even worse when it comes to the spread of West Nile virus, reports CBS News Correspondent Jim Axelrod. Harvard researchers Doug Causey and Paul Epstein discovered this unusual connection. They found that during drought, birds are forced to scrounge for water at these very same drains and catch basins. That could mean a deadly summer for drought areas out West. "In Utah, Nevada, and parts of the West and into parts of Canada, we can project that they will have an amplified problem with West Nile," says Epstein. The virus has already turned up in seven states this year, including drought-stricken Louisiana, where possible human cases are being investigated. Last year, some 4,000 people became infected, leaving 274 dead. The virus was first detected in the United States in 1999, and has since spread to 44 states. The Center for Disease Control says that it predicts West Nile will continue to creep westward. And experts believe Californian residents may contract the virus for the first time since the West Nile was identified. There is no human vaccine for the West Nile virus yet. If one is created, it may be years away from human clinical trials. A person who has contracted the West Nile virus will have few if any symptoms, but in some cases, it can cause a serious illness that affects the brain and can be fatal. Those most susceptible to the disease are the elderly. Avoid unnecessary outdoor activity when mosquitoes are most prevalent, such as dawn, dusk and early evening. 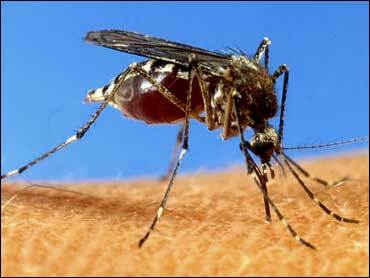 Wear long-sleeved shirts and long pants when going into mosquito-infested areas. Apply an insect repellent that contains 20 to 30 percent DEET. To minimize the risk of adverse reactions, apply it sparingly and avoid concentrations of more than 30 percent. Don't apply this type of insect repellent to children less than three-years-old. And be sure to follow the manufacturer's directions for use.